"The object of type 'ImageTargetBehaviour' has been destroyed but you are still trying to access it ". It seem that object of type of "ImageTargetBehaviour" will always destroy when " OnNewSearchResult " is fire . why they can track another targets? Still have a problem on Cloud Book Sample !! TargetSearchResult xxxx could not be enabled for tracking. I am not able to reproduce this. Do you have a license key added to this project? If so, what kind of key? I found the solution to my problems. 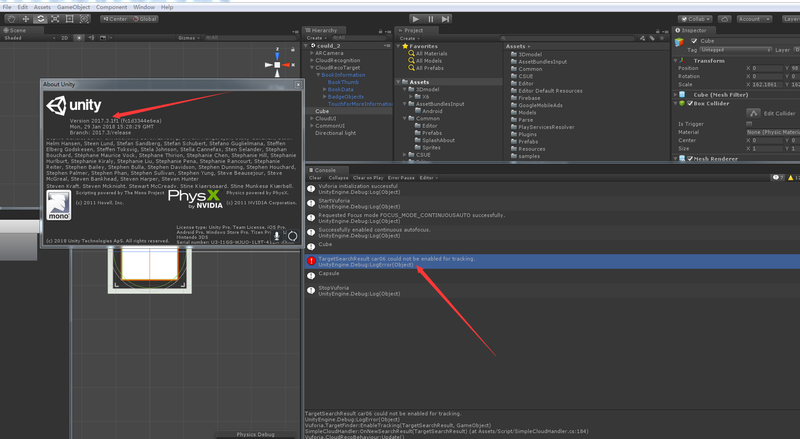 I did not disable CloudRecoBehaviour while i did not Instantiate(ImageTargetTemplate.gameObject). And everytime when we want to enable CloudRecoBehaviour we have to check. Here is the relevant code.. But how the CloudRecoTarget sample does? I do not see where they clone the ImageTagetTemplate. Can you explain more clearly please? The trackable returned with the Cloud Recognition search result is overwritten by subsequent search results. So only one Cloud Recognition trackable can exist at a time. You can track Cloud Recognition targets and Device Database targets simultaneously though.